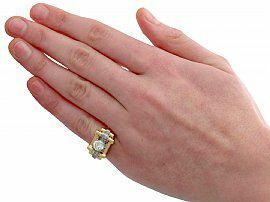 This stunning, fine and impressive vintage French diamond ring has been crafted in 18 ct yellow gold with a platinum setting. 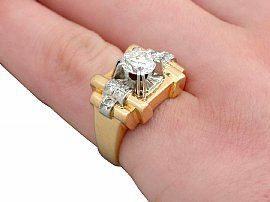 A feature 1.13 ct Old European round cut diamond is displayed in relief to the centre of the stepped, angular mount. The stepped arrangement is ornamented with raised platinum designs, embellished with six pavé set eight-cut diamonds. The subtly elevated, broad ring shoulders blend seamlessly with the plain hallmarked ring shank. The ring is hallmarked to the surface of the shank with the French 18ct gold fineness guarantee mark (eagle's head) and platinum guarantee mark (dog's head). 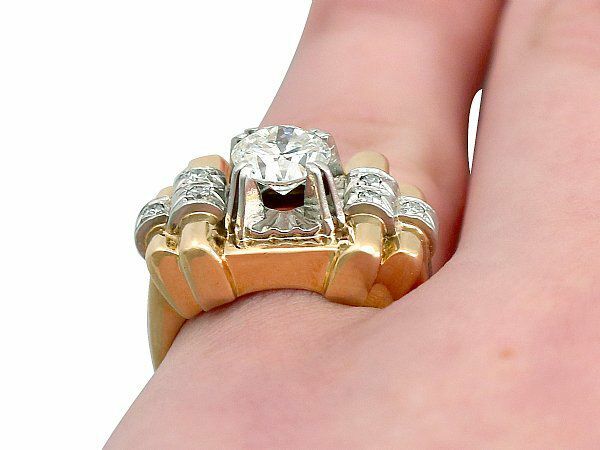 This impressive vintage dress ring is supplied with an independent diamond grading certificate for the feature stone in addition to an independent diamond grading report card for the supporting stones. This stunning vintage 1940's dress ring is fine quality set with very high colour graded, old cut diamonds. The ring is a very good gauge of gold and is in excellent condition with worn but legible hallmarks to the surface of the shank.